Silver Sneakers is the nation’s leading exercise program designed specifically for older adults. Come ride a bike, walk the treadmill, lift weights, strengthen muscles, and take a signature group exercise class all to maintain a healthier lifestyle. Silver Sneakers classes allow you to have fun and move to the music through a variety of exercises designed to increase muscular strength, range of movement, fall prevention, and activities for daily living. All classes are taught by specially trained, certified instructors. Enjoy the benefits of Silver Sneakers at the J. 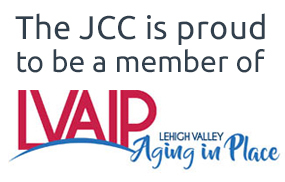 Call 610.435.3571 to check if your insurance company is a participating member. If the answer is yes, you can start exercising today at absolutely no cost. For more information about our equipment or fitness programs, please contact Nolie Schneider, Fitness Manager, at 610.435.3571 ext. 222 or [email protected].